The 'perfect' mummified remains of two girls and a boy were found on top of a volcano in the Andes. The children were probably sacrificed by Incas some time around AD 1500, according to a 1999 publication by researchers. 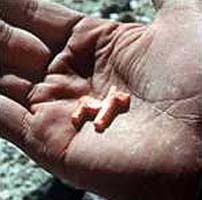 The remains were discovered at a height of 6,700 metres (22,000 feet) on Mount Llullaillaco, a mountain in north-western Argentina, near the border with Chile. 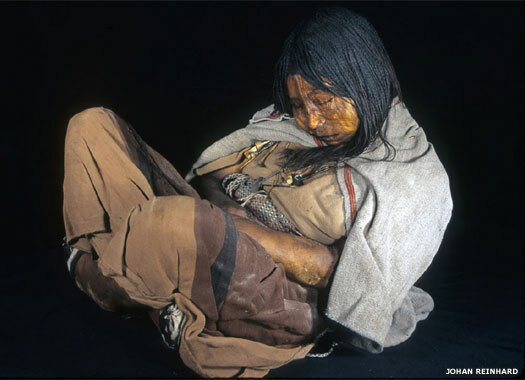 Dr Reinhard, the lead researcher behind the discovery, said the bodies may have been frozen since they had been left on the mountain by Incas. The Inca empire once covered around four thousand kilometres (2,500 miles), from present day Colombia to central Chile. Flourishing from the thirteenth century, it collapsed in 1532-1533 with the arrival of Spanish conquistadors. Even though they were buried under about 1.5 metres (five feet) of rock and earth, the internal organs of the child mummies looked perfect on a CT scan - as if they had died only recently. How these children died was yet to be established at the time of the original publication of the findings. Their burial platform carried other sacrifices, apparently to Inca gods. These included thirty-five gold, silver, and shell statues, pottery containing food, and articles of clothing including moccasins. All were in excellent condition. The undamaged female had a beautiful, yellow, geometrically-designed cover laid over her outer mantle, reported Dr Reinhard, a senior research fellow at the Mountain Institute in West Virginia. US, Argentine and Peruvian scientists worked together on the expedition, which was organised by National Geographic. Dr Reinhard, who has found several other mummies, said his team had battled snow and high winds to reach the site. At one point they had to lower one of their workers into the pit by his ankles so he could pull the mummy out with his hands.